At least at the beginning, almost any new LMS will make running your CME program a bit easier. Without ongoing technical support however, you will face an uphill battle as your program grows. Even if you’re a champion at multitasking, there are several areas where your DIY skills just can’t make up for run-of-the-mill CME platform. An LMS should be a part of a full-featured CME management platform. Without a glitch-free billing system integrated within your CME platform, you’re looking at a potential hailstorm of user experience issues as your program grows. That’s because manual payment processing is a customer service minefield. There’s no area of user experience where your consumers will be more likely to become alienated after a few false starts than billing. Your users shouldn’t have to adjust to a uniquely complicated process when purchasing a course. Ensure that your CME program has a robust, intuitive order fulfillment structure that accommodates human error. Even the most talented staff can become overwhelmed with new demands as a CME program expands. As the needs of your learners change as your program’s audience grows, you may have to change components of your curriculum to address their particular educational concerns. You’ll need an LMS that makes changing curriculum content easy. 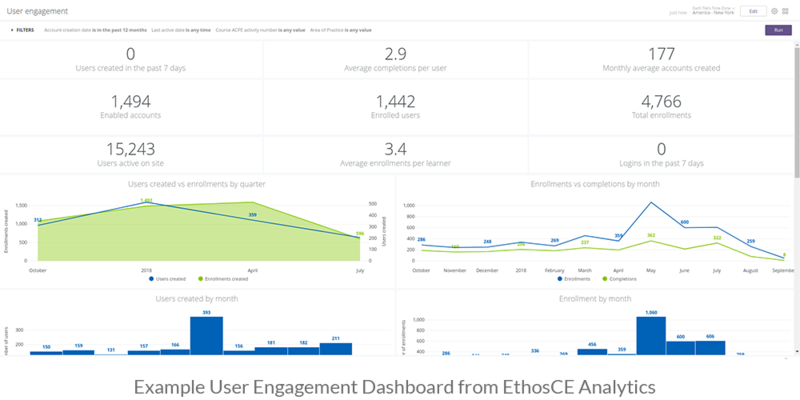 From adding video or live streams to activities to updating learner assessment questions, your LMS admin dashboard should allow you to change your content with minimal effort. Even though the platform might be intuitive and user-friendly, it needs to also provide extensive support every step of the way as you design your curriculum. During Ethos’s onboarding program, you and your team will learn how to get the most out of our content design options with hands-on training, an extensive Wiki, and on-demand post-training support via call or email. Even the most meticulous manual data scraping process can produce errors, and if your data drives your strategy-building process than those mistakes can be costly—in every sense of the word. You will need a platform that automates data collection, pulling statistics directly from the LMS and selected external sources and eliminating issues caused by human error such as data gaps and statistical entry mistakes. In addition, you’ll need access to an extensive analytics suite that provides customizable real-time and historical data dashboards in the admin panel. With a solid base for your analytics, you can view all of your critical course and learner data at a glance, at individual and aggregate levels. Support services should continue long after the onboarding process, and need to provide a comprehensive self-help system for our analytics features as well as phone and email support after an onboarding live training. 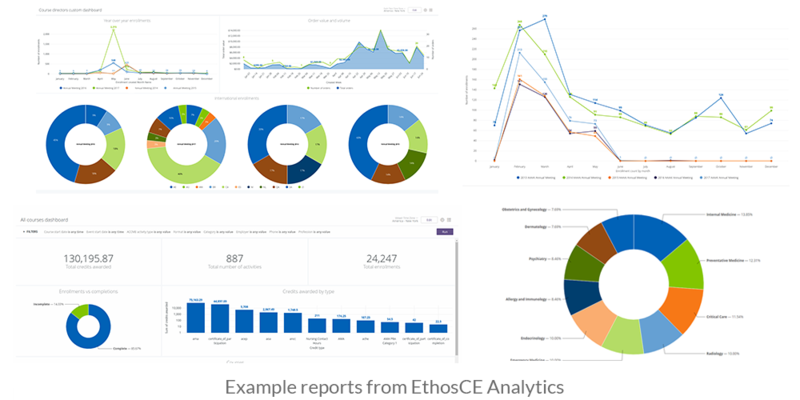 One Viable solution could be to utilize EthosCE to provide all of the tools that you’ll need to build a data-driven growth strategy for years to come. Unlike many generic LMS platform providers, EthosCE offers hands-on training as well as user-friendly documentation. Our admin dashboard is intuitive and user-friendly, with extensive self-help options in addition to in-line text help. From login design to order fulfillment, the EthosCE CME management platform was purpose-built to meet the needs of CME directors: our unique support is baked into the design of our platform. If your team is tasked with managing platform troubleshooting in addition to day-to-day administrative and managerial tasks, you’re looking at a black hole of productivity decline. Why? Because as your program expands and new learners with diverse educational levels and needs use your platform, your platform’s ability to transform in response to changing educational requirements will become more important. If you have an influx of 100 students and your team must deal with dozens of unique support ticket requests, imagine what may happen when your new enrollments double? CME management won’t get any easier, even if you hire more staff. That’s why your team shouldn’t be burdened with troubleshooting duties that could expand exponentially along with your audience. Our platform was designed to help your team get the answers that they need quickly with expert support and a user-friendly helpdesk system for registered learners. That means your team won’t have to juggle learner support requests or spend days trying to figure out a technical hiccup with an order. EthosCE helps you protect your team’s workflow interruptions by taking support duties off their plates. You shouldn’t have to ask for help—when you really need support. Get out of your old LMS and utilize the latest technology with EthosCE by scheduling a 1-on-1 walkthrough with one of our specialists today!